Fer at My Little Garden in Japan invited his visitors to take part in a blog carnival. The idea of this is to get all his visitors to write a blog post on the same subject. It seems to have kicked off a day earlier than I expected so you have two posts to browse today. One suggested topic was "My Favourite Plants" This would have given me a bit of a dilemma as I wanted to take part but I’m the sort of person who can never choose my favourite anything. 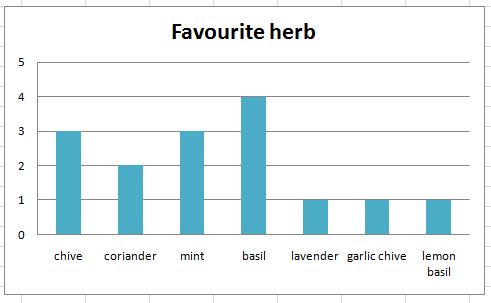 Maybe I’m fickle but my favourites depend on when I am asked or what mood I’m in. In the case of plants it really does depend on when I am asked. If there is something that looks particularly good in the garden or on the plot at that time then that becomes my favourite – maybe just for the day or the week but nonetheless a favourite. Fortunately Fer took pity on the plight of people like me and said we could write about more than one plant so here goes. To make matters a little easier I’ll confine my choices to the non edible plants – although I suppose you could eat parts of some of them! 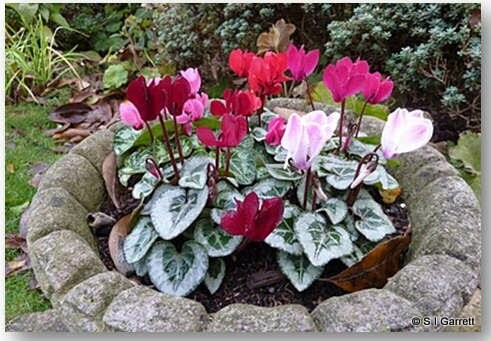 So at the moment my favourite plant is the mini cyclamen. I have a pot of them flowering in my garden and they were beautiful until the snow covered them. They lit the gloom of the day with a bright full stop of colour at the top of some steps and could be viewed from the comfort of the house. I hope they are still flowering once the snow has gone. Must admit that it was a struggle choosing between these and winter pansies which even put on a cheerful face when they are up to their necks in snow! 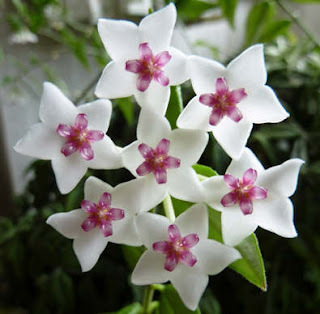 In the depths of winter I may have to turn my attention indoors and choose one of my flowering pot plants such as the hoya. The waxy flowers hang down like miniature chandeliers and can only really be appreciated by looking up into the flowers from below. We have had our hoya for lots years now and it seems to flower on and off throughout the year like many old ladies it just does what it feels like at the time. It has buds at the moment. 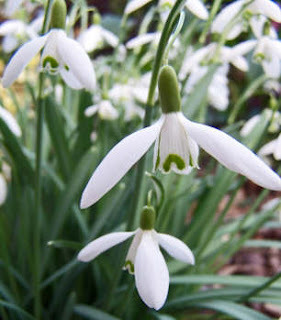 I really look forward to their appearance as for me they symbolise the start of a new season and the fact that winter may soon start to lose its grip and that spring is maybe just around the corner. 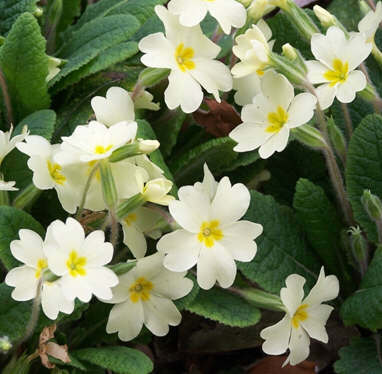 March and I’d have to choose the primrose – not the cultivated variety which although lovely just doesn’t ‘do it for me’ as much as our native primrose. It’s evocative of childhood and walks with my granddad and Rover the dog. Clumps of native primroses take over from the snowdrops in the picture frame to enjoy from the house window. We also have a whole row planted on the plot. We can enjoy these too as March usually means more time is spent at the allotment. The flowers also have a lovely delicate perfume. April and May arrive and we start to be spoilt for choice – there are lots of bulbs flowering now each of which are contenders for my favourite or the magnolia but I think I have to turn my back slightly on flowers now and choose ferns. No particular type of fern – I just love the way the new growth forms shepherds’ crooks before unfurling their feathery fronds – although I have to admit an extra special bit of excitement is generated once our tree fern begins to show signs of growth. This means it has survived another winter. 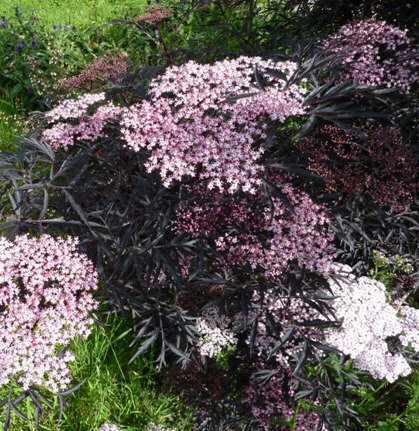 Even more problems choosing a favourite in June – I could chose the rose especially those that have a beautiful perfume but I’m going to choose Sambucus Black Lace as it was really spectacular on the plot last year with everyone who saw it falling in love with it. The pinks flowers contrast beautifully with the delicate cut bronzy leaves. What to choose for July – now this is really difficult as July is just so full of colour. 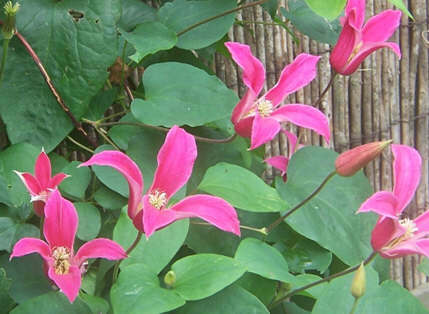 I think I’ll choose clematis – Princess Diana as I really like the colour and shape of the flowers. There are a whole host of other contenders for the July favourite though. 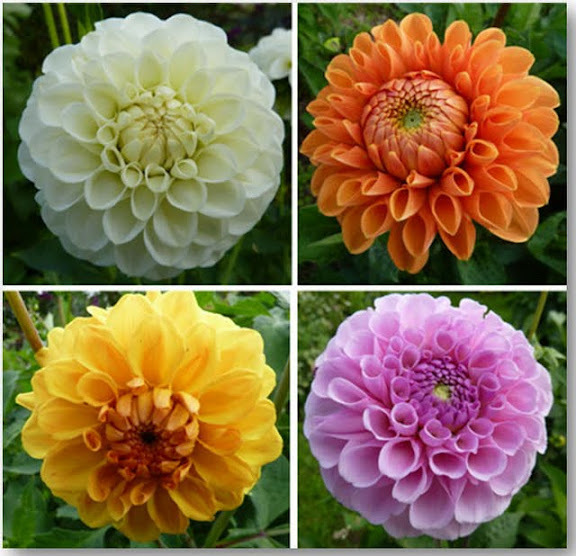 August is another tricky month with so much to choose from but I guess I have to give August's vote to the dahlia. I love the intricate shapes of the pompoms. 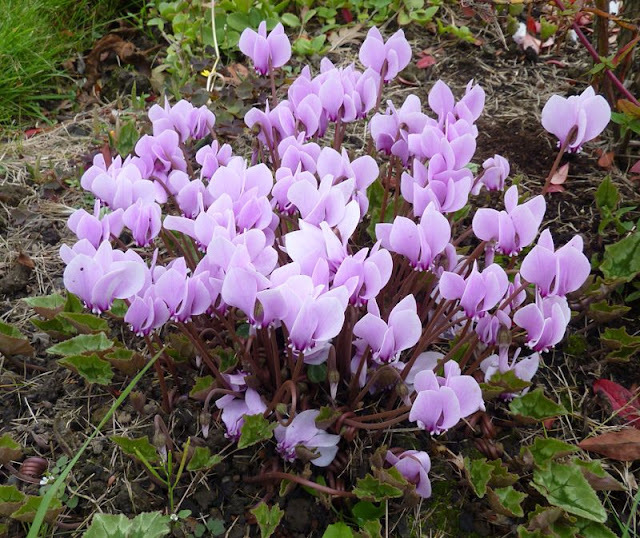 For September I am going to choose another cyclamen – I think it is Cyclamen Hederifolium. We bought a couple of corms many years ago, one was pink and the other white. The flowers appear before the leaves which in themselves are beautiful. Over the years they have seeded everywhere even amongst the grass on the allotment. Some of the corm are as big as dinner plates now. My favourite autumn plant has to be the chrysanthemum as the colours are just so – well autumnal. I really don’t know which plant I would choose as my overall favourite as it was difficult enough making this selection and if you were to ask me to do it all again tomorrow then I’d probably choose a totally different set of plants. Getting off lightly - so far! 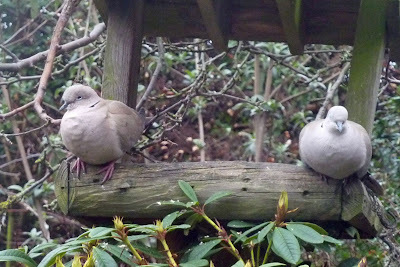 Visiting other blogs it seems that so far we have managed to avoid the worst of the snow although as you will know if you visit Martyn's weather blog we have had it very very very cold. I'm ﻿just hoping that as the snow melts the flowers will spring back into life. Fortunately our more tender plants were given some protection just before the cold weather arrived. Some in pots have been moved inside the greenhouse. The banana plants have been cut down, piled with straw to insulate and covered with sheets of polythene to keep out the worst of the wet. We have several Musa Basjoo plants - a hardy variety which - have so far survived whatever our climate has thrown at it. Banana plants are herbaceous perennials so as long as the roots are protected they should survive the winter. The stems are cut back as you would any perennial and each year more shoots spring up from the roots or cut back stems creating a mini plantation. Unfortunately we won't get any bananas from our plants and I'm sure some of our visitors from regions where bananas grow wild will think it strange that we grow them for their decorative value but we do! 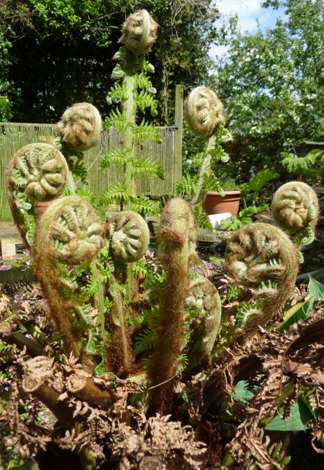 No doubt also our visitors from Australia will find it strange that we grow tree ferns in our garden. We have just one and each winter this has its crown protected by a fleece muffler. The fronds will die off but as long as the crown is protected it will hopefully produce new fronds next year. This doesn't get any protection from moisture as the crown doesn't like to dry out. Each year we keep fingers crossed until we see new fronds beginning to unfurl and each year the tree grows a little taller. The trunk is made up of previous years dead frond stems. Well we may have managed to avoid the worst of the snow up until now but with more forecast for tonight ﻿who knows what tomorrow will bring. If you are interested in what is happening with the weather visit Martyn's blog which has lots of information, photos and charts. A new feature is an updated photo from the webcam recording the weather in our garden. 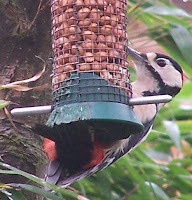 I've also updated my November diary which can be found here although so far November hasn't been exactly hyperactive! Dine al fresco chez nous. Refurbishment of our al fresco bistro is now almost completed and our winter menu in now available. Opening during all daylight hours including bank holidays. We try to appeal to as wide a clientele as possible and so we operate a self service buffet where customers are free to eat as much as they want. The bistro is divided into a number of dining areas so there should be an area to suit each individual diner's preference. For customers who prefer 'haute cuisine' there is a new high level table with enough capacity to suit those who wish to dine with a group of friends. Whilst we cannot guarantee privacy, lone diners are also welcome in this area. If this area is overcrowded there are nearby trees in which our customers can wait for a place to become free or where they can rest after a hearty meal. If customers prefer they may relax at their table with no need to feel pressure to move on after their meal. For those who prefer dining at ground level two lower tables are provided. One in a secluded area and another in an open situation. Whilst our regular visitors have their favourites from our menu some of our younger more inexperienced diners may be a little spoiled for choice. For our more acrobatic customers we provide a range of hanging meals. Vegetarian options are catered for with a range of seeds, including the ever popular and extremely nourishing black sunflower seed. Our black sunflowers are also available as take away meals with many of our customers quickly coming back for more. 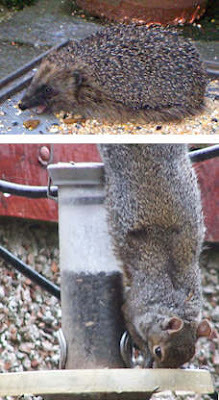 Niger seed is provided to cater for those with exotic tastes. These areas are specially adapted to suit the needs of those diners who have feet which prevent them for clinging. Whilst we should warn customers that all of our meals may contain nuts those who have a special fondness for nutty meals are also catered for. During the cold winter months our range of fatty meals will give energy to sustain our customers through difficult times. Our range of fat based meals is designed to meet the needs of both vegetarians and insectivores. From the menu diners can choose from, peanuts and raisins, peanuts and insects or peanut and mealworm. There is also a homemade option details of which can be obtained by clicking here. 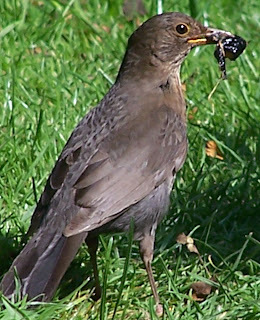 Insectivores who would like a ready meal can enjoy dried mealworms. For dessert clients may like to choose fresh coconut. or a selection of fruit and berries when available. For those diners who prefer to be more actively involved in the acquistion of their meals - foraging is permitted although we would request that flower buds are not eaten. Whilst we attempt to cater for all diets we do not under any circumstances serve fish and so any fish eaters are respectfully requested to dine elsewhere. Whilst we do not actively encourage hunting in our grounds, diners must be alert to the fact that a certain amount of hunting is tolerated and the management take no responsibility for injury or worse resulting from a hunt taking place. Fresh drinking water with or without ice is available at all times but customers should be aware that many clients will also bathe in the drinking water. Visitors from overseas are always welcome. 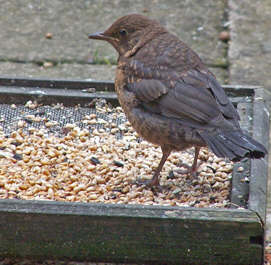 Provision is made for those feeding youngsters during the breeding season but ﻿every attempt should be made to keep offspring under control so as not to spoil the enjoyment of others. Live caterpillars and aphids may be taken in abundance as required. Also occasionally some of the feeding areas may booked by other than feathered clients and be unavailable to our regulars customers. We apologise for any disruption during these occasions. 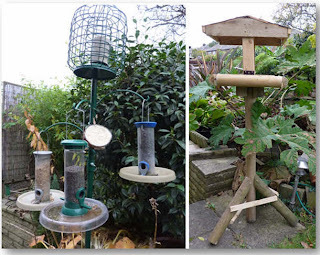 Please note in the interests of safety no net bags are used in our meals and every attempt is made to comply with all feeding advice from the RSPB and BTO. Please also note that cameras may be used and our customers may find themselves featured on our websites or blogs. All except for one of the birds, (and mammals), shown have been a visitor to our garden - can you guess which is the odd one out? 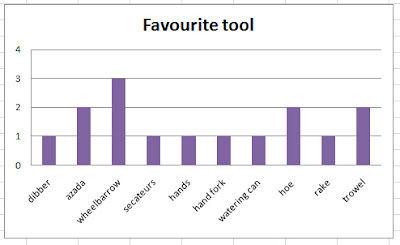 So which is our favourite vegetable, flower, herb, fruit and tool and ... competition result! 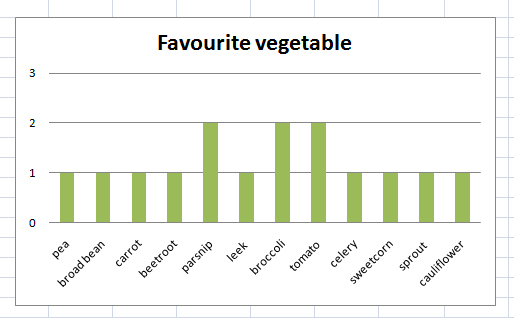 There was lots of different opinions about favourite vegetable﻿ with parsnip, broccoli and tomato (honorary vegetable) sharing top spot but with only 2 votes each. 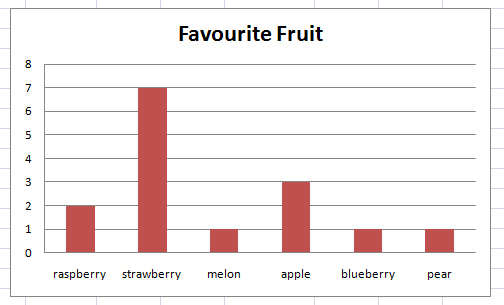 Favourite fruit was more conclusive with the strawberry knocking spots off everything else with 7 votes. Basil was top of the herbs ﻿with (if we include lemon basil) 5 votes. 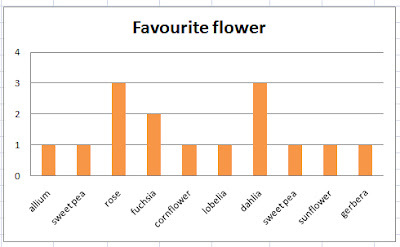 Rose and dahlias shared top spot for flowers with 3 votes each. Wheelbarrow came top of the tools with 3 votes. This is only taking into consideration the views of a relatively small number of gardeners so even though the competition has ended if you would like to post your favourites in the comments then please feel free and I'll update the results at a later date. If you entered the competition then I don't suppose any of that interested you one little bit - did you even read it? 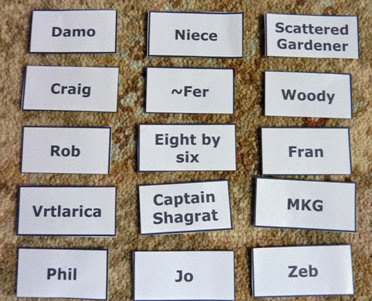 I'm afraid I don't have a toddler to make the draw as Damo did or a parakeet as Craig had so I had to wait for a friend to arrive this afternoon so we could have an independent name picker. In all we had 15 entrants - thank you for your interest. I added you too MKG even though you were outside of Europe. If you win you can nominate a recipient. So here are the labels just to try and prove everyone's name went into the bag. Congratulations to Phil - sorry that you all couldn't win! Phil can you email me so I have your email address to send you your voucher code. If I don't hear from you by next Saturday 26 November then I will offer the prize to the reserve that was drawn out at the same time but not filmed for obvious reasons! By the way have you a blog Phil as if so I will post a link to it here. My competition closes at midnight tonight and the draw will take place tomorrow. So far there are 11 entries. If you want to make it 12 then click here and join in! 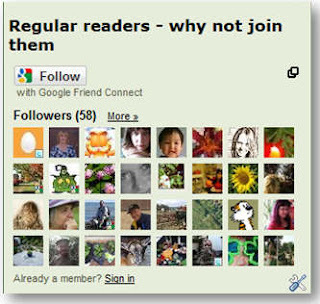 Isn't it great to see a new member appear on your followers' list but do you ever wonder whether all the people on the list are still following your blog? I'm really very envious of those of you who have followers numbering over 100 - wonder if I'll ever achieve that magic number? Sometimes, I can be guilty of forgetting to join the followers list on other blogs that I enjoy, but over winter I hope I can rectify this. Even though I may forget to become a follower, I do try and add all the blogs that I have enjoyed visiting to my two bloglists. I have one for GB blogs and another for ones with authors outside of the UK. This is set up so the order changes whenever a new post is made so that I don't miss everyone's latest posts. I have found lots of the blogs I enjoy from other people's bloglists but I'm always on the look out for new blogs to add to mine. Hopefully over winter I'll have a bit more time to browse. Then there are the blogs on my list that haven't been updated for quite a while. Maybe bloggers are too busy gardening, maybe they have other things which are demanding their time or that they prefer to do, maybe they are ill, maybe they are away from home or maybe they have given up blogging or even gardening altogether. Writing a blog may not be for everyone so maybe some decide they prefer just to read other people's blogs and why not? So how long after a blog seems to be inactive do you decide it is time to remove it from your bloglist? It's not something I like the idea of doing but lists can get too long. Another problem is if my visitors - like me - use bloglists to find new blogs maybe they are frustrated if links take them to blogs that haven't been updated for a long time. Then there are comments - I love receiving comments from other gardeners, allotmenteers or anyones else really. I try to respond to every one. Many are really helpful and others just confirm that there are people 'out there' who actually read what I have to say and enjoy the same sort of thing as I do. I know there are also readers who don't want to make a comment and that is just fine too. For some it is just a matter of feeling that there is nothing to say but sometimes for a new visitor it can almost feel as though they are gate-crashing a private party. 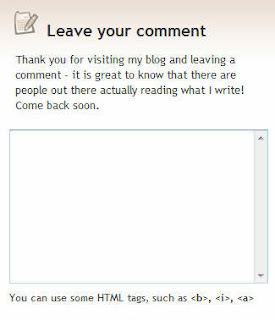 (I sometimes feel a bit like that when I visit a new blog and most of the contributors seem to have been posting comments on one another's blogs for ages). If anyone out there reading my blog feels that way then please don't - everyone is really welcome to join in and post a message - even if it is just to say hello. It's always exciting to have a comment from someone new just as it it great to build up a group of 'blog friends'. Comments that aren't as welcome are the sneaky ones that are just there to advertise some product or link to a website that has nothing to do with the topics being written about. If you think there is a blog - maybe it's yours - that I have not yet found and you think I would like then I'd love to hear about it. By the way don't forget to enter the competition - just a couple of days left. You say litchen and I say liken! This week the garden and plot have had hardly any attention at all for a whole host of reasons/excuses. The weather has been horrible gales and rain. There's more detail about our awful weather on Martyn's weather diary blog here. The garden wasn't completely forgotten as I spent a bit of time visiting a few nurseries, (not garden centres that look more like grottoes at this time of year!! ), proper nurseries. I thought it was too late to add some bulbs to our perennial flower bed but after watching them plant tulips on last week's Gardeners' World I decided to go ahead and plant some. My sister also wanted a few more winter bedding plants for her tubs and troughs. As stocks were getting low we had to visit several nurseries before finding what we wanted. I found three colours of tulips that I think should compliment one another well - the creamy white ones have a slight purple tinge along the edge of the petals. My bet is that they will all flower at different times just to thwart my colour scheme. The bulbs had just begun to produce shoots and are now safely planted so time will tell whether I get the planned display or not. The cyclamen that I planted last week are standing up to the full force of the weather and are a highlight of the garden. The weather appears to have treated us kindly in the garden with no real damage done but as yet we still have to go and inspect the plot so fingers and everything else are crossed. 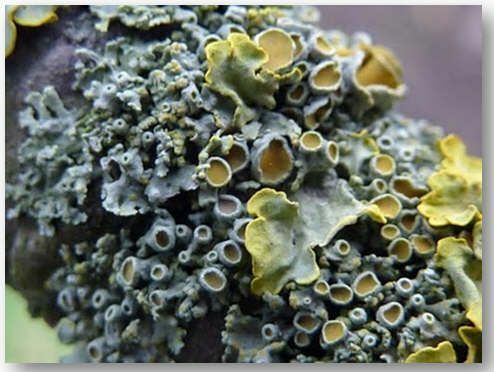 One type of plant that is thriving on our plot at the moment - is lichen. To be accurate I shouldn't say one plant as each lichen is a colony of at least two plants. The lichens are loving the conditions and are growing well on the branches of our plum trees. The damp weather has also made the lichen growing on the concrete paving flags in the garden stand out. After taking a few photos and getting a close look I was fascinated by them so decided to do a bit of research. If you would like to share what I found out then I have posted an article here on my website along with lots of photos of the lichen growing on our plot and in the garden. So which do you say 'litchen' or 'liken'? I also have posted an article on how we grow our garlic on the website so again if you are interested it is here. Lastly if you haven't yet entered the competition to win £25 to spend on seeds then there is still time. For more information and to enter click here. With cold weather threatened we decided to concentrate on protection last week so first stop was a local farm where we bought several bales of straw. The first to receive protection were the dahlias - we have left these in the ground for several years now and in spite of being on heavy clay soil they have survived under a protective layer of straw and polythene. This year we dug up and reburied the tubers. This meant that we could use less space for storage. Our method of protecting dahlia tubers is told in more detail here. As we have quite a lot of beetroot we are also trying ﻿to see if we can protect the roots over winter with straw in a similar way. Although﻿ parsnips are hardy and don't really need any protection from frost, it can be fairly difficult to harvest the roots from frozen solid ground so we have also placed some straw as a mulch around them and hope this may help keep the ground diggable!. There's also a snippet of the video that we took at Old Moor RSPB reserve here on my November diary page - there were lots of water birds to see but my favourites are always the garden birds! By the way if you haven't already don't forget to enter the competition click here for more information and to enter. Win a £25 voucher to spend on the Vegetableseeds.net website. The competition is open to visitors to any of our blogs and websites. Unfortunately the seed company only ship within Europe. 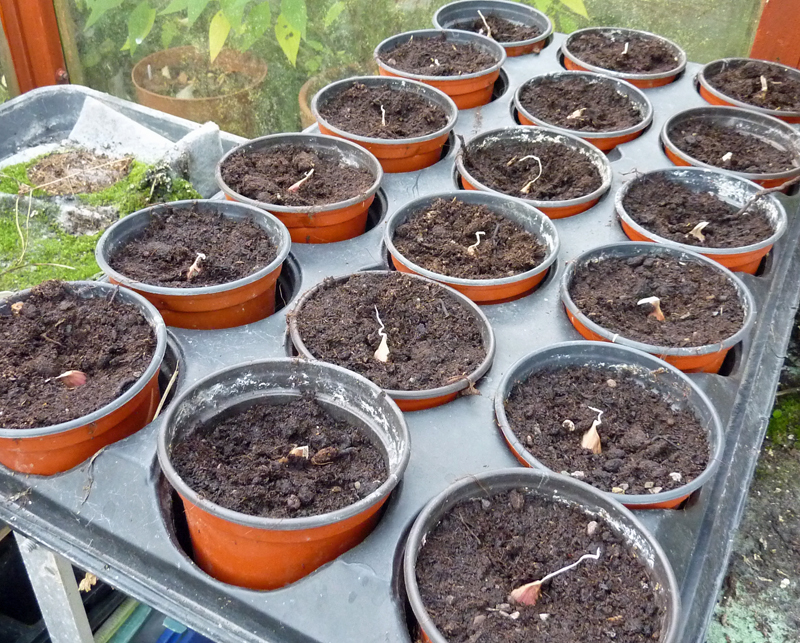 This week I split one of the large garlic bulbs that we grew last year and planted the cloves in pots in our cold garden greenhouse. We did this last year and then planted the sprouted cloves out on the plot in mid March. All in all this method proved rather TOO successful as I ended up with more garlic than we would ever use even after giving some away to whoever wanted any. My sister in particular was fed up with me asking "Do you want any more garlic?" This year I'm trying to be more restrained and have planted up 18 cloves - there were 19 in the bulb but my tray holds 18 pots! 18 garlic bulbs should be plenty shouldn't it? Anyway moving on to the near miss with botulism. 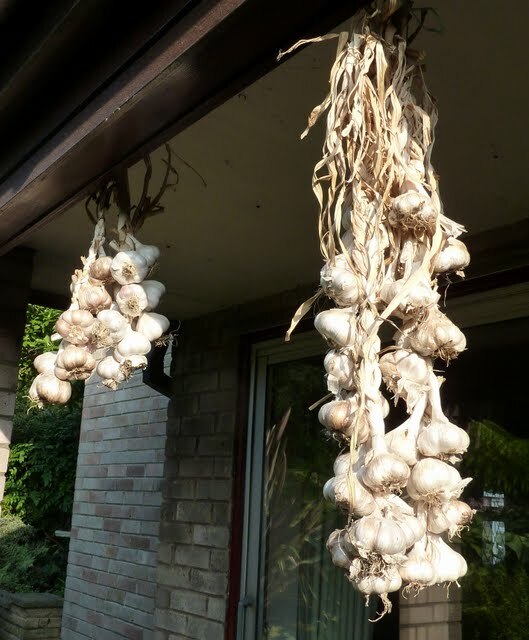 Having loads and loads of bulbs I decided that I should try to preserve some to use in the gap when the fresh garlic is dried out or sprouting and harvesting the next lot of bulbs. I thought maybe if I chopped up the cloves and popped them in oil they should be OK as you can buy them like this in the supermarkets. Luckily I decided to research this a bit first and found out that the stuff you can buy in supermarkets is treated specially as once peeled garlic kept at even refrigerator temperature can develop botulism. Apparently the only safe way to preserve garlic at home is to freeze it! You can freeze it as whole bulbs, whole cloves or chopped so I decided to freeze some freshly pressed! When I had finished the whole house and my hands reeked of garlic. Even after a couple of days the faint smell of garlic is still lingering. Maybe if I do any more I'll have to set up outside like Martyn did when he made our piccallili! I've added my diary entry for the last week in October - click here - and also another photo alum - click here. Just click on the links if you are interested. Martyn has also published the complete weather charts for October on his blog click here if you want a look.